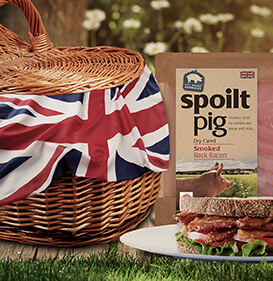 To enter, like our Facebook, Twitter or Instagram post and tell us what you feel makes a great picnic for the chance to win several packs of our British, Award Winning spoiltpig bacon. #NationalPicnicWeek. Competition closes 24th June. 2. Promotion Period: The promotion will run from 08:00 on Friday 15th June 2018 until 23:59 on Sunday 24th June 2018. 3. To Enter: Like a promotional post on spoiltpig’s Facebook, Instagram or twitter page and tell us what you feel makes a great picnic for the chance to win. 5. The Prizes: 3 x smoked back bacon, 3 x unsmoked back bacon, 3 x smoked streaky bacon. 6. Winner Selection: Winner will be selected by 2nd July 2018. Winners will be selected by a computer process that produces verifiably random results.